Here in Michigan, we have the blessing of frosty landscapes and white winters. Despite the beauty of this winter wonderland, these temperatures can dip to uncomfortable lows and make it much less convenient to spend any time outside playing or exercising. So, what can we do inside our cozy homes to burn energy without freezer burning you or your dog outside? First off, mental stimulation can be more energy depleting than physical activity. That being said, there are a plethora of options for mind games to play in the comfort of your own home to beat cabin fever. Impulse control is a skill that a lot of dogs lack. However, this simple game can help develop self-control with any dog of any age. Here’s how you play: Sit calmly on the floor with your dog. Place a cookie in your hand and slowly open your hand so that your dog can see it. If they reach for it, close your hand. If they become over zealous with pawing at your closed hand or start gnawing on you, completely remove your hand from their sight. Once your dog has calmed down, bring your hand back out and attempt to open it again to reveal the cookie. The goal of this exercise, is for you to be able to leave your hand open with the cookie visible, with your dog waiting until you release them to take it from you. Hide and seek is an age old favorite. A simple game of hide and seek through your house can be both exciting and fun for hiders and seekers alike. 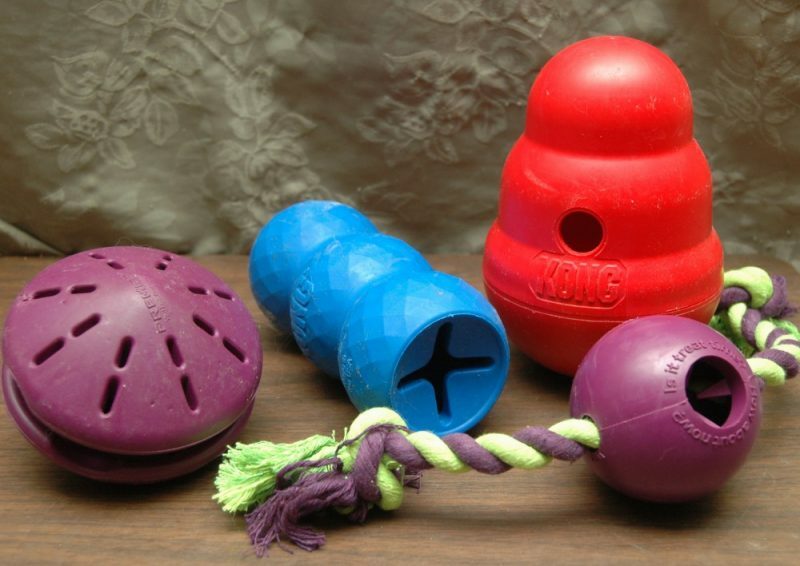 There are several different puzzle toys that can be used to hold your dog’s meals. Having them think about how to get the food and then having them work at it, is a great way to encourage brain use and problem solving. It also slows down food bolting dogs. 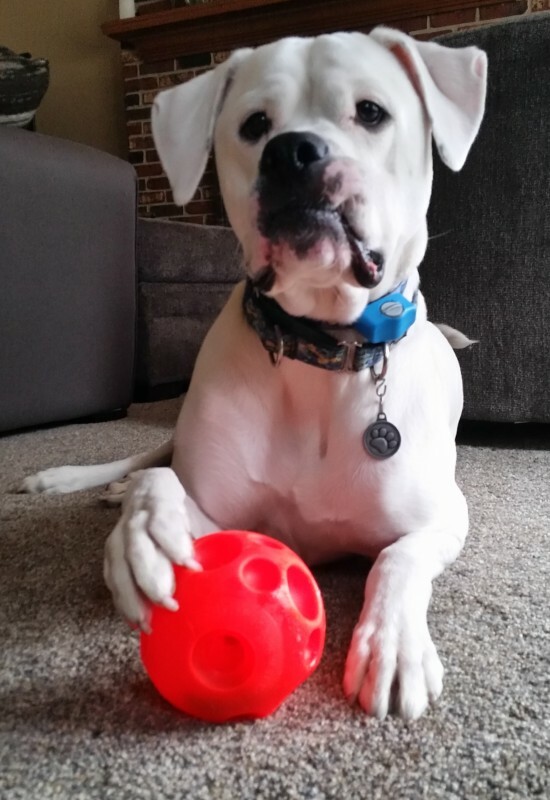 Rolling a ball across the floor into a corner can be a way of enjoying fetch in a controlled environment. The short distance does not allow for them to achieve maximum speed, but can still be stimulating for dogs who miss their regular fetch sessions outdoors. This also decreases the risk of things getting broken in your home. So, say you want to teach your dog to put their front feet on an aerobics step and you are using a clicker (or word/sound that is associated with treats/food). Think of Pavlov’s dog, in which the ring of a bell means that food is coming. If your dog is not comfortable with interacting with the step, you can simply click and reward for them just looking at it. This constant reward system should eventually teach your dog that any interaction with this new thing is positive. They should eventually progress to getting closer to the object or may even offer to touch it, maybe with a nose or a front paw. Building up to the desired behavior until that goal is reached requires problem solving and uses some extra brain power in order to do so. Here is a link of what shaping crawl under with a clicker for our visual learners. Mental stimulation is a wonderful tool to use with any dog of any age, and usually can be done anywhere. It is great for teaching dog how to learn, beating boredom and improving cognitive function. However, if you also would like to pursue more physical exercise with your dog, we offer fitness sessions that focus on muscle strengthening and/or weight control, depending on what your dog needs.